In the “find a location” enter your location details. The tool will give you opening hours and driving directions. You can prepare your shipment on site. DHL provides you with the packaging. Enter your sender and receiver details in the online form. In the shipment details section, enter your description of contents. 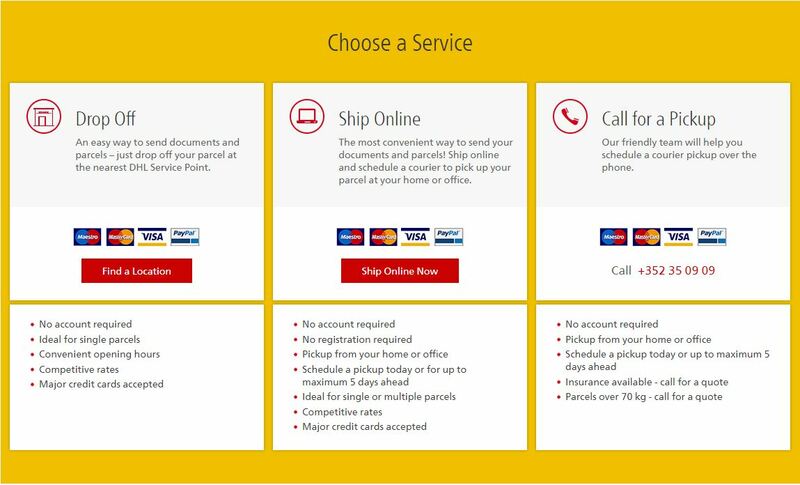 Select the desired service options/when the package needs to be delivered. Include the pickup location details with sufficient details for our courier for package collection. You can include the email address of your recipient to send the tracking number of your shipment. Settle your payment, after accepting the terms and conditions. Prepare your shipment for pickup as per the agreed timing. Call us on +352 35 09 09 , select your language and press 1. Provide your sender and receiver details to our certified international specialists. Describe the content of your shipment as detailed as possible. Specify whether insurance is desired. Provide the pickup location details with sufficient details for our courier for package collection. The certified international specialists will provide you with the total shipment charges. You will need to verbally accept. Print the shipping document as attached to the mail you get from DHL. Click here for packaging advice.